Hello Students! Today we are going to talk about very important topic of now days. Everyone want to study harder in less time at this time. We are going to inform you how you can prepare for the examination in very less time? Check 7 killer tips to Prepare for the examination in a Day. You may check best 7 Tips which are going to help you for any kind of exam whether it is Engineering Exam, Medical Exam, or any other competitive examination. We are quite sure that this article is going to be helpful for you. All you need to read this complete article and start working on your exam like that. As time passes, your exams seems tougher to you guys. If you have less time to study for any exam, then you check this article out and get more updates from here. Here below are 7 main tips which will help you passing all exams. Suppose you have only one day left and then you need to study for any exam and pass this exam with good grades. #TIP-1 At first, this is important for all of you to check out the Format of that examination. You have to check numbers of exam questions, mode of exam, type of exam, type of questions in that examination and more details of this examination. Ultimately you must be having proper Syllabus and important topics of this examination. #TIP-2When you are starting your preparation for that examination, make sure you are fully focused for that examination. Study so well for that exam so that you don’t need to do any other work at that point of time. No distractions should be there. #TIP-3Make sure you don’t have any Phone, or gadget which will change your mind. This is the time to focus on that examination only and you don’t need to do any other thing at that point of time. Collect basic and main information of that examination easily from the official website of that exam. #TIP-4This is possible to develop your memory in short time. Stay cool while studying and you don’t need to take so much stress for that examination. You must have clear face and image of your examination this time. Collect meaningful information of that exam only. #TIP-5This is also important that you are getting good amount of sleep before the night of examination. If you are not getting it then this can be your negative point for this examination. You need to sleep well and keep your mood fresh for this examination. While learning, try to obtain as many different kinds of impressions as possible. #TIP-6Try to improve your memory all the time so that you can store more data for that examination. We are wishing you guys best of luck for this examination. If you don’t study well then there is no way for you to study for this examination. #TIP-7 Last time study is very important for all candidates about this examination. If you are not studying well then there is no way to pass this examination. Pre Planned preparation is must for all candidates. Best wishes to all candidates this time and you also need to stay positive for this examination. 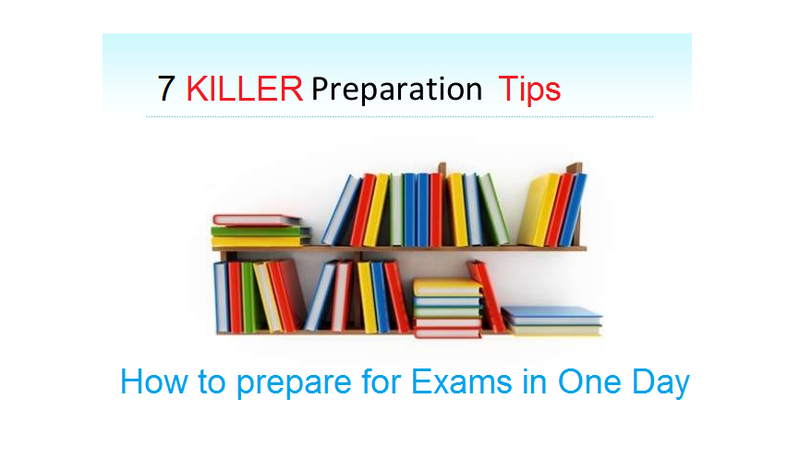 Here you have checked and get 7 Killer Preparation Tips for Exams in One Day. Now it’s up to you to prepare well for your exam. Download full study material including syllabus, Exam Pattern as well as previous year model question papers so that you can score well in the written examination.